With both Canada Day and Independence Day happening this week, we want you to see the colours (or colors) of your flag!! I made a red and white Canadiana inspired tag. Some of my very best memories as a kid were camping in Algonquin Park with my family every summer. I might have had my first kiss right there at Rock Lake!! My dad used to take us "moose hunting" at dusk, which really meant we were driving around looking for wildlife...we saw lots of beavers, lots of moose and the occasional bear! I owe my super amazing campfire skills to my dad and what we call "the Whiteman school of fire building." I didn't have any twine to match my tag, so I pulled some white twine through the Candied Apple ink pad a few times and voila, matchy matchy! As always we'd love for you to join the crew and play along. While you are there, please share some loves with the rest of the crew! Fabulous tag depicting life in Canada. Awesome tag, love all the big and little critters. Your sentiment sounds FABULOUS!!! Fun post to read, and I really like your #proudcanuck! Cute! Awesome Canada inspired tag! 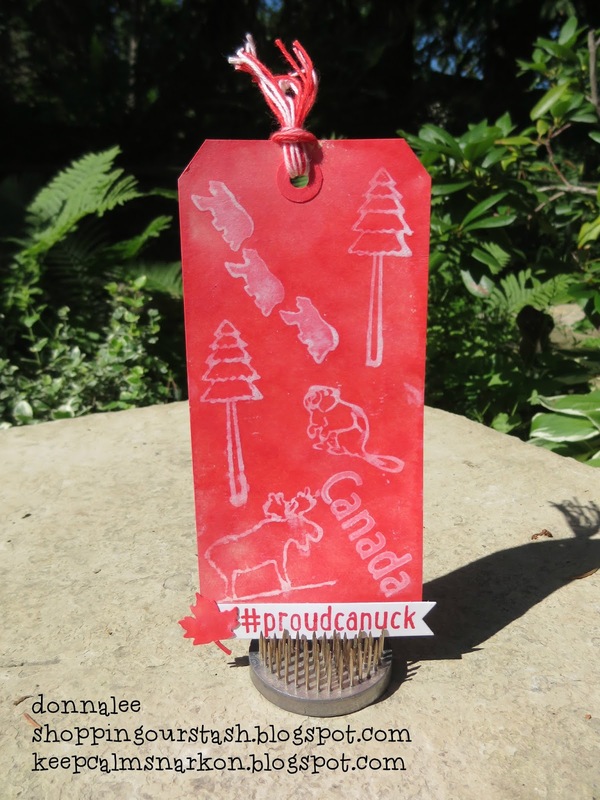 Love how you matched the twine, and the stamps are awesome, especially the #proudcanuck!